The EXAKT 520 Light Polymerization Unit can be used to embed specimens for medical research as well as industrial samples. This unit was developed for use in biomaterials and medical research applications. Since the EXAKT Cutting/Grinding System is used for bone and other hard tissue research, dehydration and infiltration of tissue samples with the Technovit 7200 or other plastic resins can be particularly challenging. Technovit 7200 embedding media is light sensitive, so a dark environment is required for the infiltration steps. The EXAKT Dehydration & Infiltration System provides agitation and vacuum for the process. As many as six processing steps can take place simultaneously. In medical research, it is difficult to fully infiltrate a sample with resin (Technovit 7200). Poor infiltration leaves openings in the sample surface that can lead to damaged cell structure or staining artifact. Historically, the method for repairing such a sample required placing the sample back in the liquid resin until the solid resin dissolved back into a liquid. This is quite time consuming. With the EXAKT Re-Infiltration Unit the poorly infiltrated sample can be dried, re-infiltrated with liquid resin (Technovit 7200), and the resin polymerized in a matter of hours. For researchers working with bone and other thick samples where plastic embedding is the protocol of choice, this unit saves time and money. For histologic samples and any other protocols where a thin section (10-25 microns) is required, it is imperative that plane parallelism be maintained throughout the sectioning protocol to insure evenness in the final specimen thickness. 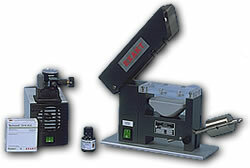 The EXAKT 401 Vacuum Adhesive Press is used to mount specimens in a specific plane. This eliminates steps to face the sample block. The unit is used with the EXAKT/Technovit 4000 Adhesive. When preparing a thin section of tissue next to a biomaterial, making sure that the sample is perfectly presented to the abrasive surface is the ultimate key to success. Also, an optically clear field is essential when looking at the sample under the microscope. In order to insure that all of the precision of the EXAKT Cutting/Grinding Equipment could be maximized, EXAKT, together with Kulzer, developed an adhesive, Technovit 7210, which would provide an even adhesive layer that would not polymerize until exposed to blue light. This way, any bubbles in the adhesive layer could be dealt with before becoming permanent. The Lucite block lets the technician see the spread of the adhesive and view any bubbles that may arise prior to beginning polymerization. The use of this press provides the technician and the researcher with a sample that is not distorted by the adhesive layer underneath it.